Libya’s shaky financial position, looming humanitarian crisis and the inability of State authorities to provide services have created a “vicious cycle” where groups with vested interests are trying to step in and undermine the Government, the United Nations envoy to the north African country warned on Wednesday. 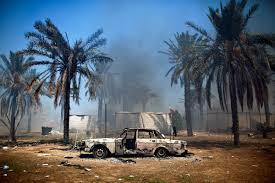 “For many Libyans this abnormal state of affairs has become the new normal. This vicious cycle must stop,” Ghassan Salamé, the Special Representative of the UN Secretary-General for Libya, told the Security Council Wednesday via teleconference from capital Tripoli, reports a UN press release. In his briefing, Salamé informed the 15-member Council that the UN Support Mission in Libya (UNSMIL) remains focused on conducting free, fair and credible elections before the end of 2018. In that process, UNISMIL recently concluded voter registration process, adding one million new voters to the rolls, he said, noting that the total number of voters stands now at 2.5 million. At the same time, the country continues its efforts to adopt a permanent national constitution, including the approval of a draft by the Constitution Drafting Assembly in July last year. However, challenges persists vis-a-vis a constitutional referendum and the question of referendum legislation remains hotly debated, added the senior UN official, noting that the political process must progress and a status quo is untenable. In addition, Libya remains fraught with violence and localized conflicts, and armed groups – including those formally integrated in State structures – continue to operate outside the law and perpetrate human rights abuses, the UN press release said. There has also been a sharp rise in crime, and human trafficking, while illegal flow of arms into the country continues unabated. “In a country awash with arms […] the arrival of more arms will only hamper such efforts and damage the political process,” warned the senior UN official, calling on the Security Council to exert its utmost influence to stop arms from entering into Libya. In his briefing, Salamé spoke of the challenges confronting migrants – both those originating from Libya as well as those using the country as a transit – and called for the issues to be addressed taking into account its trans-boundary nature. He also informed the Council of the Libyan Humanitarian Response Plan launched in January that aims to reach over a million people with assistance. Ghassan Salamé (on screen), Special Representative and Head of the United Nations Support Mission in Libya (UNSMIL) addresses the Security Council.